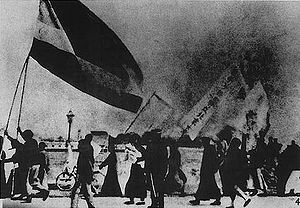 The May Fourth Movement began in China with large-scale student demonstrations in Tiananmen Square, Peking against the Paris Peace Conference and Japan’s Twenty-One Demands. These demonstrations sparked national protests and marked the upsurge of Chinese nationalism, a shift towards political mobilization and away from cultural activities, and a move towards populist base rather than intellectual elites. The broader use of the term “May Fourth Movement” often refers to the period during 1915-1921 more usually called the New Culture Movement. 200,000 protestors take to the streets of London to protest against the newly introduced Poll Tax (Community Charge), introduced by the Conservative government led by Prime Minister Margaret Thatcher. By far the largest occurred in central London on Saturday March 31, 1990, shortly before the poll tax was due to come into force in England and Wales. Many believe the riot – the largest in the city in the 20th century – caused Thatcher’s downfall eight months later. In Detroit, Michigan, one of the worst riots in United States history begins on 12th Street in the predominantly African American inner city (43 killed, 342 injured and 1,400 buildings burned). The precipitating event was a police raid of a blind pig on the corner of 12th Street and Clairmount on the city’s near westside. Police confrontations with patrons and observers on the street evolved into one of the deadliest and most destructive riots in U.S. history, lasting five days and surpassing the violence and property destruction of Detroit’s 1943 race riot. The riots known at the time as Draft Week, were violent disturbances in New York City that were the culmination of discontent with new laws passed by Congress to draft men to fight in the ongoing American Civil War. The six-day Gal Oya riots, the first ethnic riots that targeted the minority Sri Lankan Tamils in post-independent Sri Lanka, began, eventually resulting in the deaths of at least 150 people and 100 injuries. On Friday Thai police and army units moved in to surround and cut off the protesters main camp, meeting heavy resistance from the red shirts resulting in the deaths of two people with dozens more injured. Thai Army Major-General Khattiya Sawasdipol who has defected from the government forces and has been advising the Red Shirts on security and defence matters was hit in the head by a sniper’s bullet and is reportedly in a critical condition in hospital.